This book examines the factors which contribute to local green development in China and employs political ecology to analyse the relationship between power and the environment. Specifically, it looks at which actors control access to resources and are therefore able to promote environmental progress. Following the reform and opening-up of China in the 1970s, entrepreneurs and local officials profited economically and politically and formed close relationships, known as Guanxi in China. As a result, they have also been criticised as those responsible for the associated ecological damage. This book does not contest this association, but instead argues that the current literature places too much emphasis on their negative influence and the positive influence of their environmental work has been neglected. 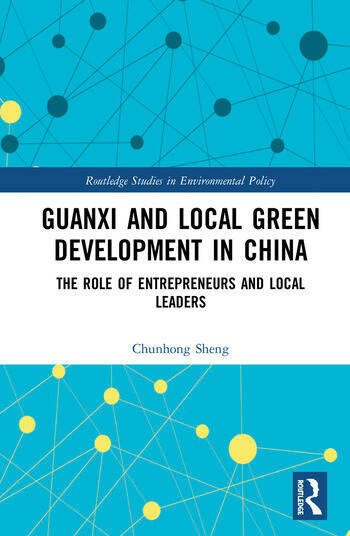 Building on three case studies where local green development is being pursued, Shanghai Pudong New Area, Baoding and Wuning, this book shows how local officials and entrepreneurs can also be the crusaders of a greener environment at the local level in China. This book will be of great interest to students and scholars of Chinese studies, with a particular interest in environmental policy and politics, business and society, as well as those interested in sustainable development more broadly. Chunhong Sheng is a post-doc fellow at the China Center for Special Economic Zone Research, Shenzhen University, China.